While surfing the internet last week about web development tools that helps to create a mobile optimized website, i stumbled upon a powerful yet easy-to-use tool for someone like me who doesn't know anything about HTML, LoL. Today, i will like to share with you - GinWiz. 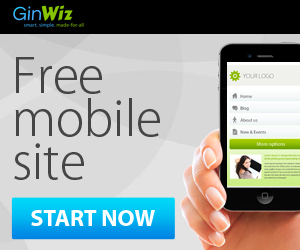 If you need a mobile website or you already have a website and you now want to make it mobile, i will advice you to try GinWiz because you will be able to create your mobile website free of charge and also you can easily design a mobile optimized website with their simple mobile site builder in just few minutes. With the mobile site builder, just fill in the details of your website correctly and the mobile site builder will do the rest. In a few simple steps, you will be able to make, build and create a mobile version of your website and make it completely compatible with different systems and devices, even if it is a simple site or an eCommerce one. - Automatic conversion of your website into a user-friendly mobile version. - Easy with numerous editing option with no coding skill required. - Works with all Smartphones, Tablets and Mobile devices. - Get full statistics on your mobile site usage including Device models, Unique visitors and Daily pageviews. - Customize your preffered design style with numerous templates available. - Add your social networks to your mobile site e.g Facebook, Twitter, Email. How Do I start Building and Designing My Mobile website ? - Fill in your Email Address (Username) and Password to sign up. - Then you will be directed to your dashboard where you will start designing your mobile site immediately. Do you have any problem using this tool ? or Do you have any comment or question ? Kindly drop your comments, questions or suggestions here, I will be glad to help you. Hope This Helps!!! thanks for this information..but will this affect the pc view of your websit? ?